Facebook has executed a masterful response to Yahoo’s patent trolling that protects it legally but still makes it look like the victim. Here I examine how for almost every patent Yahoo claims Facebook infringes upon, the social network has countersued with a stronger, more specific patent for content feed sorting, advertising, and privacy. Facebook will maintain the moral high ground, and likely bypass a costly settlement. But there’s none of Facebook’s blood in the water, nothing for the sharks to circle. It could have gone much worse. When Yahoo announced its attack, Facebook didn’t surrender and pay up like Google did back in 2004. It chose the smartest of the four defenses outlined by Chris Dixon and others. It refused to settle and pay out valuable stock to close the case before its IPO, which would have shown weakness and encouraged further trolling by Yahoo and others. It didn’t go silently to trial, and risk a massive damages judgement. Nor did it stoop to Yahoo’s level and lash back at full force, suing Yahoo for every Facebook patent it infringed on. Instead it looked through its limited patent portfolio and as Ars Technica points out, probably bought some more at the last minute, to trump each of Yahoo’s claims. It countersued with these, and brandished just one extra sword to seal the deal. That’s Facebook’s patent of people tagging in photos, a core innovation that propelled it to popularity, and that Yahoo’s Flickr blatantly copied. Now Facebook appears as the champion of invention and the ideals of Silicon Valley, and further vilifies Yahoo. As CNET reports, prominent figures like SoftTech VC Jeff Clavier and vocal opponents of patent trolling like Yammer CEO David Sacks are now rooting for Facebook. It doesn’t help that Yahoo stabbed Facebook in the back while relying on it for easy login and referral traffic. Below I examine in detail the meaning of each of the patents Facebook is countersuing with, and compare their validity with the Yahoo’s claims. In all but one patent category, privacy, Facebook’s either has the upper hand or stands on near equal footing. If Yahoo does infringe on Facebook’s patents, it may have been making millions of dollars a year in ad revenue thanks to improved ad targeting, and increased engagement from Flickr photo tagging and news site home page content relevance. Those could turn into damages awarded to Facebook or offset the money Facebook made from infringing on Yahoo’s patents. Whether the cases go to trial or private negotiation, Facebook might walk away clean. Even if Yahoo does come away with a settlement, the whole debacle won’t have been nearly as lucrative as if Facebook hadn’t countersued. Meanwhile, no matter the outcome, Yahoo hangs its head in shame. Abstract: Systems and methods for generating dynamic relationship-based content personalized for members of a web-based social network are provide…Further exemplary methods comprise weighting by affinity. Facebook claims that Yahoo’s Flickr Photostream, Recent Activity and Groups Activity on the Yahoo! Flickr photo sharing service copy its news feed. Flickr does show a personalized feed of content from one’s contacts, and may sort it by affinity. If Yahoo’s patent is enforceable, most of today’s most popular websites would also infringe upon. Because Yahoo’s patent is more likely to be ruled invalid, Facebook has the upper hand here. Abstract: A method for tagging digital media is described. The method includes selecting a digital media selecting a region within the digital media. The method may further include associating a person or entity with the selected region and sending a notification of the association the person or entity or a different person or entity. The method may further include sending advertising with the notification. Photo tagging was a key early innovation for Facebook that launched in 2005 and drove massive user and engagement growth. It’s become one of the defining features of the service. Flickr added people tagging to its service in 2009, and answered a common complaint about Facebook Photos by allowing users to opt out of being tagged. Facebook claim’s Flickr’s “People in Photos” feature violates this patent, and indeed, Flickr’s tagging works almost exactly the way Facebook’s patent describes. This is Facebook’s one claim that doesn’t have a Yahoo counterpart. It was likely included as negotiation insurance in case its other responses fail to offset Yahoo’s attacks, and to fight Yahoo’s infringement claim for its unified messaging patent, which I’ve written could be Yahoo’s most valid claim against Facebook. U.S. Patent No. 6,288,717. Inventor: Terry Dunkle (HealthScout). Filed Mar 19, 1999, issued Sept 11, 2011. Abstract: The program uses the topic interest flags to determine which articles and other customizable elements of the the database are shown on a particular member’s home page. The headline posting algorithm first checks the flags on every available item against the member’s interests, recorded in his or her user profile, then weighs the importance, rarity, and significance of each match it has found, and finally displays the three highest-scoring items on the member’s home page in descending order of value. This patent was seemingly purchased by Facebook from Dunkle, who invented it to power his personalized health news network HealthScout. 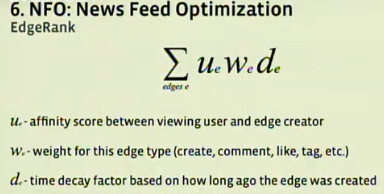 It could cover Facebook’s EdgeRank news feed sorting algorithm which determines what order to display news feed stories in to maximize relevance. Facebook claims that all of Yahoo’s home pages that use its Content Optimization and Relevance Engine (C.O.R.E) to sort content for display infringe on this patent. The patent specifically covers the process of a user selecting content categories they’d like to see and then receiving matching updates, which Yahoo uses to customize it’s home pages. The “Headline Posting Algorithm” patent is another more specific version of Yahoo’s “Dynamic Page Generator” patent, and could be more enforceable, giving Facebook an advantage. U.S. Patent No. 6,216,133. Inventor: Judith F. M. Masthoff. Filed May 30, 1996, issued April 10, 2001. Abstract: A user of a system comprising a large set of information items, for example a multimedia database, is assisted by an agent in searching the set. The agent has a given affinity for the information items and selects a specific information item from the set in conformity with said affinity. On the basis of the interactions between the user and the system an image is formed of the affinity of the user for the information items. The agent utilizes this image, in addition to its own affinity, for the selection of a specific information item. A major application of the invention concerns a system in which the information items are presented as objects in a space and in which the agent guides the user through the space and proposes a specific object to the user. This patent defines creating “agents” that mirror the preferences of the users they represent. These agents can then be used to predict which ads or content will be be most relevant to a user and then displaying them. Facebook claims that advertisements on Yahoo’s news and Flickr properties infringe on this patent. Yahoo may use this type of technology to assess which ads are most likely to be clicked based on a user’s preferences. The validity of the claim and the advantage will depend on how Yahoo actually creates ad profiles, but the patent could help Facebook combat Yahoo’s ad sorting patents. U.S. Patent No. 6,411,949. Inventor J. David Shaffer. Filed Aug 12, 1999, issued Jun 25, 2002. Abstract: Enhanced content data is supplied in association with a media selection. The enhanced content data is customized responsive to a user profile. The uncustomized enhanced content is stored as a data structure having levels of nodes. Each node within a given level represents an alternative version of a shared enhanced content sub-topic. A processor chooses between nodes within the levels and assembles the chosen nodes to produce the customized enhanced content data. While the abstract is vague, the patent essentially covers providing contextual information alongside a piece media such as a photo, video, sound, 0r text. Depending on a user’s listed interests, they might see different information. For example, alongside a song by the band U2, a user with a high stated interest in band might see recent news about its members, while a users who are tagged as musicians would see notes on the band’s musical technique. There’s also some substantial back-end technology regarding how to store contextual data in a graph structure. Facebook uses a similar technology to show the faces of friends who’ve interacted with a piece of content or an ad. Facebook claims that ads across Yahoo’s news sites and Flickr violate this patent. This is one of the more vague patents Facebook cites, but it could pertain to Yahoo’s social ads that display marketing messages alongside the news users read. It could offset Yahoo’s ad sorting patent claim against Facebook. U.S. Patent No. 6,236,978. Inventor: Alexander S. Tuzhilin (Professor Of Information Systems, NYU). Filed Nov 14, 1997, issued May 22, 2001. And U.S. Patent No. 7,603,331. Inventors: Alexander S. Tuzhilin, Gediminas Adomavicius (Associate Professor of Information and Decision Sciences, University of Minnesota). And, U.S. Patent No. 8,103,611. Inventors: Alexander S. Tuzhilin, Gediminas Adomavicius. Filed Sep 3, 2009, issued Jan 24, 2012. 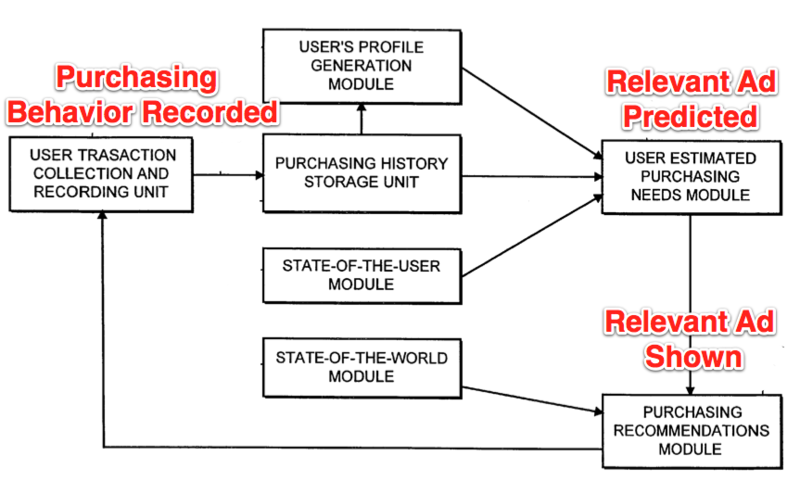 Abstract ‘978 and ‘331: A system and method for generating a user profile for a user based on a static profile and a dynamic profile of the user. The static profile includes factual user information. The dynamic profile includes dynamic rules which correspond to transactional information of the user. The method and system compresses the dynamic rules into aggregated rules so that the user can view a comparatively small number of the aggregated rules and select the desired rules from the aggregated rules based on user-desired criteria. The dynamic rules associated with the particular user are matched to the selected desired aggregated rules to generate the dynamic profile. The static and dynamic profile are then combined to form the user profile. The system and method can be used in conjunction with a Personal Shopping Assistant system and a Personal Intelligent Digital Assistant system. Abstract ‘611: Exemplary non-transitory computer-readable medium, method and system for providing at least one recommendation to users and applications using multidimensional data. The multidimensional data can define a multidimensional space defined by a Cartesian product of the dimensions. The multidimensional space can have at least three dimensions, and each of the dimensions can be capable of (i) providing variable information, and (ii) having a type that is different from a type of another one of the dimensions. The exemplary non-transitory computer-readable medium, method and system can retrieve information from data associated with the multidimensional space. Further, the exemplary non-transitory computer-readable medium, method and system can generate the at least one recommendation based on the retrieved information. Further, at least one of the dimensions can include profiles. These three patents define combining static, biographical user information with dynamic behavior information to efficiently create rules for predicting user preferences, and then generate recommendations. In the context of advertising, this technology could be used to predict what ads will resonate with users at what times to maximize click and conversion rates, and then show users those ads. Facebook claims Yahoo’s ad systems infringe on these patents. While it’s difficult to tell whether this is true, Yahoo likely employs some sort of ad targeting profiling which could be covered. Facebook could use this patent to offset the three ad sorting patents Yahoo is suing it with, though Facebook’s patents are slightly more general than Yahoo’s slightly more ad-focused patents. U.S. Patent No. 8,005,896. Inventor: Chris Cheah. Filed Jun 17, 2010, issued Aug 23, 2011. And U.S. Patent No. 8,150,913. Inventor Chris Cheah. Filed on August 22, 2011, and granted April 3, 2012. Abstract: An information management and distribution system is disclosed. The information management and distribution system facilitates the controlled exchange of contact information over a network. The system can support one or more of creation and design, rolodex, exchange, and update features. In one embodiment, the information management and distribution system can include a networked server system accessible by remote user devices via the network, and at least one database maintained by the networked server system and storing content information and exchange settings of registered users. These patents define the ability for users to “friend” each other on a social network and give each other access to up-to-date personal and contact information. It also covers privacy settings where users can set certain personal information as accessible only to people in a certain category. Facebook uses this technology to allow users to connect to each other, and to power its friend list and “privacy bucket” (only me, friends, friends of friends, public) privacy settings. Facebook claims that the the ability to establish relationships with other users and set privacy settings on the Yahoo! Flickr photo sharing service” infringes on this patent. Flickr allows users to set their photos as visible to categories of people such as friends or family. These patents are likely intended to offset the privacy control patent Yahoo has sued Facebook with. This is the one Yahoo patent that is more specific its Facebook counterpart, and where Facebook infringes more clearly than Yahoo does. 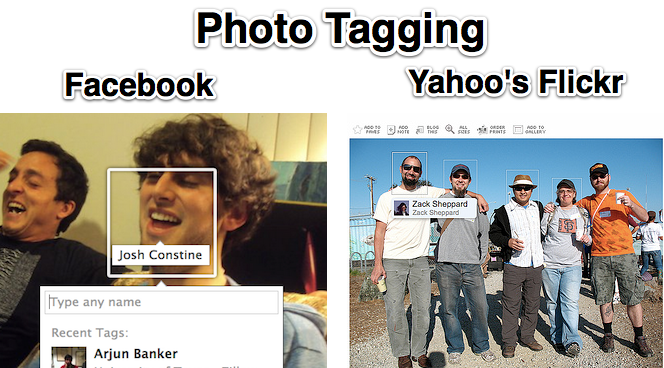 Facebook’s photo tagging patent could come in handy to nullify this Yahoo advantage.